Available for order from today, the all new MacBook Pro is now the lightest and the thinnest MacBook Pro ever. 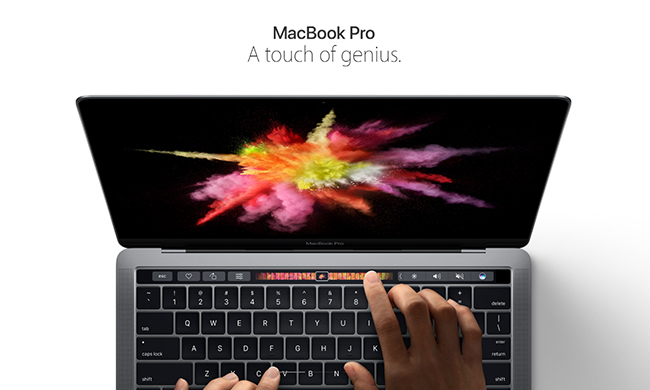 It also features a breakthrough interface that replaces the traditional row of function keys with a brilliant, Retina-quality Multi-Touch display called the Touch Bar. It also the first MacBook with the security and convenience of Touch ID for fast login and Apple Pay. The 13-inch MacBook Pro with Touch Bar and Touch ID starts at S$2,588, while the 15-inch variant starts at S$3,388. There will also be a 13-inch MacBook Pro without the new Touch Bar and Touch ID available at S$2,188. The new MacBook Pro also features Apple’s brightest and most colourful Retina display yet, a more responsive keyboard, a larger Force Touch trackpad and an audio system with double the dynamic range. It’s also the most powerful MacBook Pro ever, featuring sixth-generation quad-core and dual-core processors, up to 2.3 times the graphics performance over the previous generation, super-fast SSDs and up to four Thunderbolt 3 ports. The Touch Bar places controls right at your fingertips as it changes its functions and display according to the apps you are currently using, like Mail, Finder, Calendar, Numbers, GarageBand, Final Cut Pro X and many more, including third-party apps. For example, the Touch Bar can show Tabs and Favourites in Safari, enable easy access to emoji in Messages, provide a simple way to edit images or scrub through videos in Photos and so much more. The new MacBook Pro features an entirely new enclosure design and all-metal unibody construction that creates an incredibly rigid and dense notebook that is amazingly thin and light. 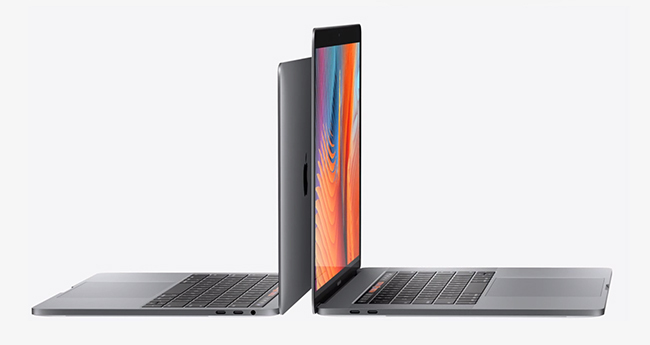 At just 14.9 mm thin, the 13-inch MacBook Pro is 17 percent thinner and 23 percent less volume than the previous generation, and nearly 226g lighter at just 1.37kg. The new 15-inch MacBook Pro, at just 15.5 mm thin, is 14 percent thinner and 20 percent less volume than before, and weighing just 1.83kg, is nearly 226g lighter. Once you enrol your fingerprint in Touch ID on your MacBook Pro, you can quickly unlock your Mac, switch user accounts and make secure purchases with Apple Pay on the web with a single touch. Touch ID enables a quick, accurate reading of your fingerprint and uses sophisticated algorithms to recognise and match it with the secure element in the new Apple T1 chip. As thin as a MacBook display at 0.88 mm, the Retina display on the new MacBook Pro at 500 nits of brightness, is an amazing 67 percent brighter than the previous generation, features 67 percent more contrast and is the first Mac notebook display to support wide colour gamut. And with power-saving technologies like a larger pixel aperture, a variable refresh rate and more power-efficient LEDs, the display consumes 30 percent less energy than before. Sixth-generation dual-core Core i5 with eDRAM, dual-core Core i7 with eDRAM and quad-core Core i7 Intel processors deliver pro-level processing performance while conserving energy. The new 15-inch MacBook Pro features powerful Radeon Pro discrete graphics delivering up to 2.3 times more performance than the previous generation; while the 13-inch MacBook Pro comes with Intel Iris Graphics that are up to two times faster than before. All models feature SSDs with sequential read speeds over 3GBps and Thunderbolt 3 which consolidates data transfer, charging and twice the video bandwidth in a single port — allowing users to drive a 5K display and power their MacBook Pro with a single cable. macOS Sierra, the world’s most advanced desktop operating system, with new features like Siri integration, Universal Clipboard, Apple Pay on the web and Photos, which helps you rediscover your meaningful memories, organise your library and perfect shots like a pro.